We spent the weekend decorating the outside of our house for Christmas. You would think that after two full days we would be done but we’re not even close! We finished about half the projects on our list. One thing we did finish was our outdoor Christmas planter. 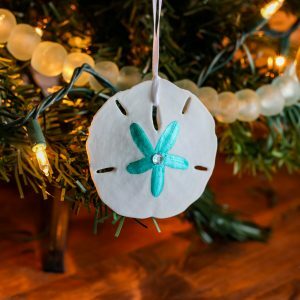 This is a fun, easy and inexpensive project that brings a big impact to your outdoor Christmas decorations. 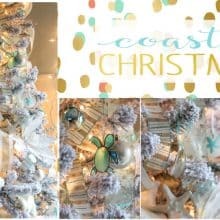 This is week three of the DIY Home Decor Christmas Blog Hop and this week’s theme is Outdoor Decor. 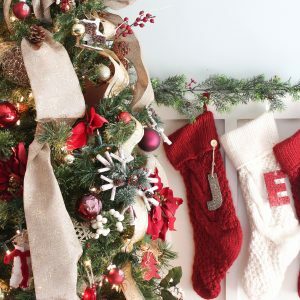 Be sure to visit the other participants at the end of this post for lots of great outdoor Christmas decorating. Over the warmer months we have annuals in these planters at the beginning of the path to our front and side doors. For winter I bought two arborvitae, one for each pot. They are great screen trees so in the spring I will move them to the back property line to replace a couple of large cedars that fell during Florence. After the little trees were planted, I cut branches from our magnolia trees, some holly and cedar. I layered the branches around the base of the tree, going the same direction all around. First the cedar, then magnolia then holly. Using florist wire and both ribbons, I made a bow and used a piece of extra branch as a stake to stick it into the dirt. Then I just layed the ornaments on top of the greenery and added white twinkle lights. Quick and easy! The best part about making an outdoor Christmas planter with a real tree is being able to plant the tree in your yard but if you prefer an artificial tree, that’s fine too! 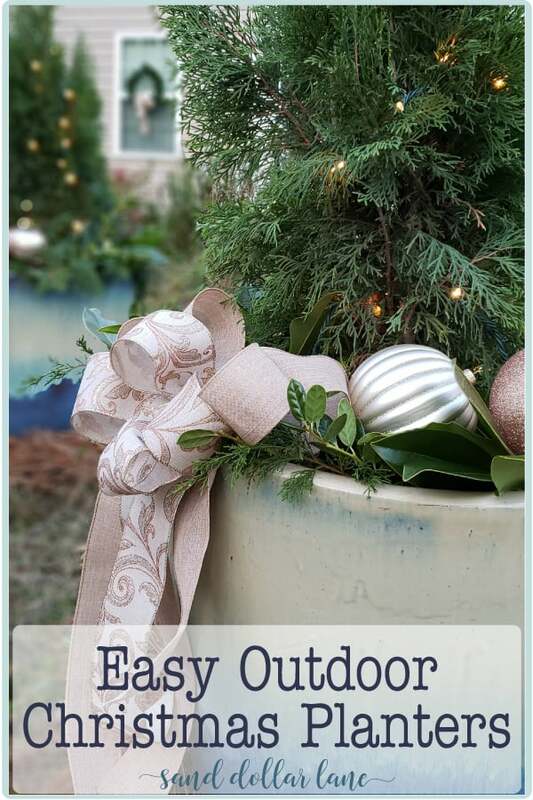 Ready for more inspiring outdoor Christmas projects? We’ve got plenty! 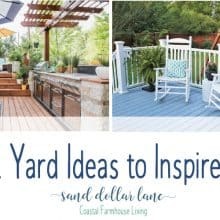 Super easy and I love that the planters get more use than just the summer months! 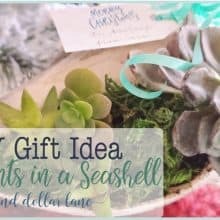 Love how easy this is to turn from a spring planter to one you can use in the winter! Okay, I absolutely love that ribbon! Not to mention the idea of a pretty live tree that can be replanted. I love love love a beautiful big planter… I can’t wait until I have the space for one. I love the versaility and how simple it is! Looks beautiful! I love the colors you selected and all of the natural elements! So very pretty! !